So, I’ve been thinking about how much 5th graders will buy what you are selling, in a good way. It was definitely an “if you build it they will come” moment. The first students to arrive saw the cafe and went right over. They didn’t have to; it was before school started. By the time school was actually supposed to start the cafe had spilled out into the rest of the room. I had to change the morning plan. The next morning, I did not put the sign on the board. The first students came in and said, “The cafe isn’t open?” Well, I may be a lot of things, but I like to think I’m not an idiot, at least all the time. So the day after, the cafe was open again as was artifact reconstruting (we are studying archaeology at the moment). Once again, an hour later, I finally had to say we needed to close the cafe. But for an hour, students were writing, reading posts of other students, and commenting. One student even did some online investigating for a post. Now, we still have work to do on writing quality and/or interesting posts. But, I for one can definitely put up a sign with some loopy designs if that is what my students want. Anyone else blogging with students? So, I’ve been thinking about student blogs. I’ve had a class blog for the past 2 years. We use it mainly for language arts-related activities and a lot of the comments are required work. It has been a great experiment. I am asking students to write more creatively. Students are enjoying the options, giving each other feedback, and getting a lot of thinking and writing practice in the process. We are learning how to be a digital community of learners as well as a face-to-face community. Towards spring last year, I had students take over facilitating discussions on the blog. It was their idea, and they took it very seriously. It was really great to see. So, this year, we have our class blog up and running and prize-in-hand, I was ready to start student blogging. We’ve talked, multiple times, about appropriate use. I’ve sent a letter to parents describing the plan and the safety aspects. Parents have returned the letter, with signatures. We’ve made charts of potential ideas for posts based on interests (partly stemming from our “5E Day” event-read about it here. ).We were ready to go. The only problem was I had all kinds of trouble with Edublogs. Links don’t work to activate accounts, etc, etc. My class blog is on wordpress and I’m pretty good at all the “back-office” stuff. But, after a number of hours setting up accounts, or not, I had to walk away from the computer. So, I checked out kidblogs and set up an entire class with blogs and passwords in about 15 minutes. The thing is, it’s not at all attractive, and I am a visual person. Just looking at that plain old list of names and posts makes me sad. I discussed the situation with some folks at school and got a number of different responses. Finally, I showed my students the choices, trying really hard not to sway them one way or the other. And the vast majority (by this I mean all but 1 or 2) wanted an edublog. And, because they’re my kids (just not my personal kids) I went back for another round with Edublogs. This time I was victorious. So, today we started writing on the blogs. Most had written or at least had begun a post last week. We toured the dashboard, wrote, changed themes. There was a lot going on, even considering I had only half the class at a time. I set up all the student blogs under my account and then added the students as contributors. This allows them to write posts, but means I must approve them before they are published. I, wrongly as far as I can tell so far, guessed that I could get to everything that was awaiting my approval easily or at least know it was there. Nope. I have to go to each dashboard, click “posts” and then I can tell if one is waiting. I will have to check the settings and see if there is some way to at least get a notification, like I do with for waiting comments. On the very bright side, the kids are really excited. I heard, “I love my blog!” more than once this afternoon. And, by the time I got back to them this evening to approve posts, etc. there was even a comment on one. I’m going to think positively and figure I will get faster at working with Edublogs. I’m enjoying reading a number of the blogs already! 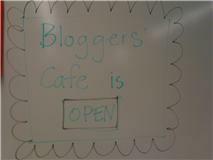 Next up, a “Blogger’s Cafe” in the classroom. So, I’ve been thinking about the book I just started reading yesterday afternoon. It was a beautiful day. My older child was out with her grandmother, the younger was napping, the husband was maybe reading maybe sleeping on the couch. I had a moment. So, I gathered up a pile of books and headed outside to enjoy the beautiful weather. A year or so ago someone was getting rid of some books at school and I picked up The Courage to Teach by Parker Palmer. I had never read it and recently have heard it mentioned or suggested a few places (can’t remember exactly where). So yesterday I actually started reading. Ok, I know I only read the first chapter, but why hadn’t I read this book already? That is my question. Even though it’s hardly a new book (copyright 1998), it’s totally relevant to what is going on today in education (at least the first chapter is). Good teaching requires self-knowledge: it is a secret hidden in plain sight (p.3). Technique is what teachers use until the real teacher arrives (p.5). Good teachers possess a capacity for connectedness (p.11). Anyway, I am really appreciating the reflection on the connection to self. But, I think that had my younger self read this book, she might have thought it was a little too goofy. When I taught in the Chicago Public Schools, I was moved to a new grade every other year (once 3 times in 3 years). I always tried to reflect on my teaching and the students’ learning, but with having to get up to speed on a new language arts, math, and social studies curriculum with each move (I taught pretty much self-contained classrooms) I didn’t have as much time to reflect as I would have liked. Now, this is my 6th year in the same grade. I admit that I was worried about being in the same grade for for more than 2 or 3 years at first. But, then I really hit my stride and started to innovate more. I realized that I knew the curriculum well enough to be thinking about where I wanted to end up and plan accordingly. Sometimes you just read the right book at the right time. Anyone else reading the right book right now? To review, I thought I would listen in on what my students said, here and there, and share a selection once in a while. For this first installment, several quotes (marked with *) are from our 5E day which I wrote about here. -(to new student) Do you want to play with us at recess? -(to me while standing in the lunch line looking at a photo of a city at night) I think cities are so beautiful at night. They’re like amusement parks with the rides all lit up. -I’m a really busy person. -Can I explain it different than [sic] my group? I think it’s the same answer, it’s just my brain works in a different way. -I didn’t know what ‘scowl’ was until we had it for vocab. I’ve already got some good material for the October post! Has anyone else overheard anything good lately? So, I’ve been thinking about all the (un)conferences I attended in person or virtually this last year (school year). I of course wanted to write complete, thoughtful reflections on all of them, but as my 5th graders like to say, that is SO not going to happen. Instead I offer a brief round-up of sorts. So now to the main events, in chonological order. Participated all year in PLP as part of a school team. I went to Educon at Science Leadership Academy in Philadelphia. (I did write about it, twice actually, here and here.) Link to new conference registration etc. I have attended numberous hour-long interviews/presentations/sessions hosted by Steve Hargadon, The Future of Education, and Classroom 2.0. Join Classroom 2.0 and you can get weekly schedules. Here’s a link to the schedule of many of the events. In the spring I attended EdCampPhilly, a day long unconference organized by a dynamic group of folks. Now other EdCamp events are springing up everywhere. I’m planning to go to EdCampyNYC on December 4th. Also, then attended NTCamp organized by Andy Marcinek. I had family stuff to do so only got to attend part in person. Also a great day. I see another event is planned for this winter in Burlington, MA. This summer, I attended Reform Symposium 2010 virtually. I sat in (through elluminate) on a bunch of great presentations. At two events I won random door prizes–1 in person and 1 virtually, always nice. Anyway, the point here is that there are so many options, many of which do not even involve getting dressed or leaving your couch, if you so desire. For me, as not only a teacher, but a mom of two young kids, I have a hard time convincing myself to spend weekend time away from family, even though said family may drive me crazy. But, I have frequently found myself with time available at the last-minute as the planets align just right so that either everyone is playing together happily or napping. It’s great to feel part of a community of learners. So, I’ve been thinking about my ideas about education and technology use in education. I have been participating in professional development through PLP with my school for several years. For the first two years I was part of a school team and now this year I am working alongside another new team from my school but am also a Fellow for the program through ADVIS (Association of Delaware Valley Independent Schools). As a Fellow, I am assigned to three school teams as their mentor or helpful-idea-person. PLP is run by Sheryl Nussbaum-Beach (see her blog here). Will Richardson also works with PLP (see his blog here and book here). Each year at the first face-to-face meeting Sheryl and Will both speak. Will is usually the one who sends people over the edge. The first year, I thought Will was on the fringe, at best. (I may have wanted to ban the word “passion” from all conversation.) The second year, I was amazed at how much he had mellowed. And this year, while I many not agree with everything he says, I certainly did not find him to be radical in any way. But, I was sitting with an entire group of first-time participants this year. Some of them had a very different reaction than I did. Some thought he was radical and extreme. (He admits he’s trying to challenge folks.) So, that made me think about who has really changed in the past three years? Has Will changed? Or, have I? More careful to support teaching as a profession and teachers. Goes a little slower and doesn’t bombard the audience with too many examples. I know the lingo now. I have not only dipped my toes in the edtech pool, I’ve waded in. I’ve joined several virtual education networks and have reasserted myself as a learner (it was tough there for a few years with babies at home and too little sleep). I’ve realized that there is a lot of professional development to be had on my schedule (which means on the couch, after the kids are in bed, possibly while I am wearing pajamas and/or folding laundry). I am continually updating and upgrading my definition and understanding of what a contemporary education can and should be. I am actively looking for ways my students can develop a positive digital footprint rather than hide their feet altogether. I am looking for ways my students can put themselves “out there” in appropriate ways and connect with other students, classes, teachers beyond our school. I have gotten over the use of the word “passion,” although I still can’t quite use the word myself, I am looking for more ways to have students working engaging with their personal interests during school. I have a PLN full of teachers, most of whom I have never met. So, it seems like it might be more me. Anyone else feel they have changed in the past few years?